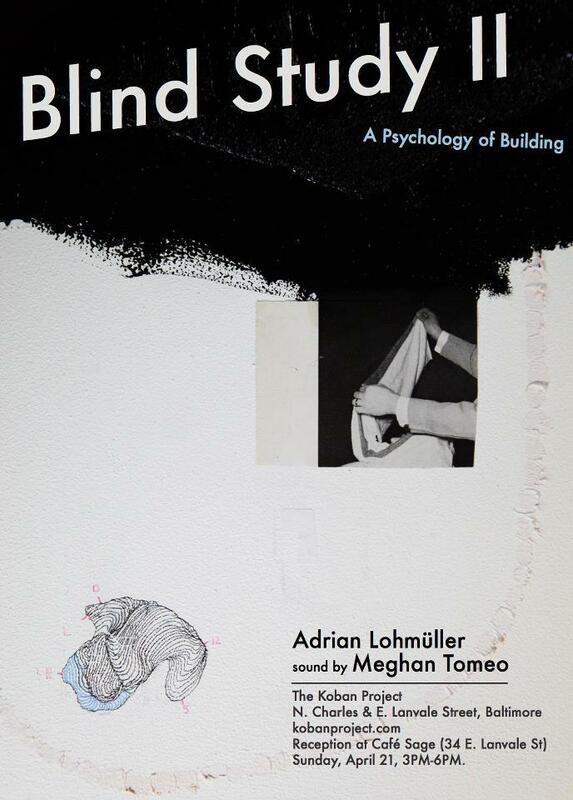 “The surveillance police booth is cloaked in dense, black, domestic curtains thus preventing the inherent function of the one way mirror,” writes artist Adrian Lohmüller, setting the stage for his installation Blind Study II (A Psychology of Building). Lohmüller’s enigmatic environment will be the inaugural exhibition for The Koban Project, a new experimental art space located on the SW corner or Charles and Lanvale in the Station North Arts & Entertainment District. Employing domestic materials Lohmüller will subvert the assumed function of the former police station, preventing its use as a site of voyeurism and scrutiny. A study, perched atop the police box itself and thus outside the gaze of the authorities, welcomes viewers to engage with Glenn Robert Lym’s text “A Psychology of Building,” or perhaps contemplate what books they might line the otherwise empty shelves with. The installation includes a sound piece by Meghan Tomeo. From the interior of the cloaked booth emanate voices of people recounting intimate spatial experiences and their positions within their immediate architectural surroundings. Please join us Sunday, April 21st, 2013 from 3-6PM at the Café Sage (34 E Lanvale Street) for a reception with the artists and organizers of The Koban Project. Local artists will go brush-to-brush to compete for cash and other prizes during Art War, a new addition to this year’s Salisbury Festival on Saturday, April 27. Student, amateur and professional artists will have five hours, starting at 10 a.m., to create a piece live in front of festival-goers. Those attending the festival will vote on which work they like best. Winners will be announced at 4 p.m. The first-place artist receives a solo show at a Salisbury University Art Galleries location. Gift certificates and cash prizes are available for second and third place. Each artist is given a 10-foot-by-10-foot space in which to create. Indoor and outdoor spots are available. Setup begins at 9 a.m. Artists must bring their own supplies, including tables and chairs. A drop cloth and basic lighting are provided. Entries may be comprised of any material that is not hazardous, illegal or damaging to the provided space. SU Art Galleries sponsors the competition. The entry fee is $20. Interested artists must sign up by Friday, April 19, at www.salisbury.edu/universitygalleries. Entrants should include three to five images of past work in jpg format, at a resolution no higher than two megabytes per file, along with a one-paragraph description of the art they plan to create during the event. 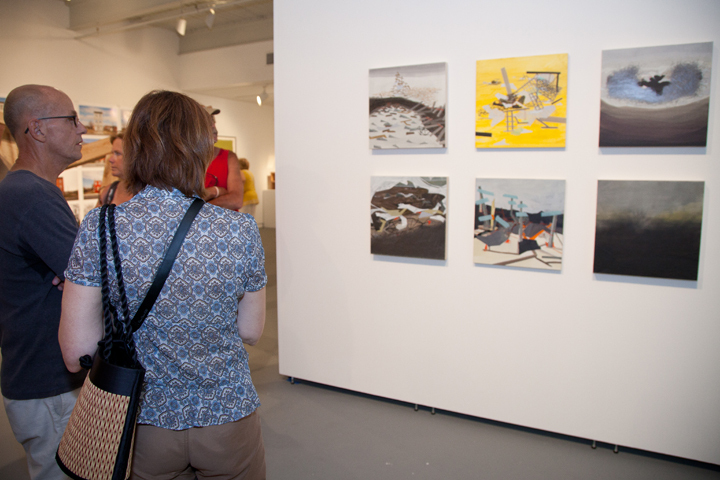 For more information call 410-548-2547 or e-mail University Galleries Director Liz Kauffman at eckauffman@salisbury.edu. Two communities have been awarded $30,000 each to complete their projects. The Greater Remington Improvement Association will produce an “R” sculpture and crosswalk art at the corner of 26th and N. Howard Streets. The “R” sculpture will serve as a recognizable entry point and identity marker for the neighborhood, as well as an anchor for a new public space that will be created at that site for the community. The sculpture is intended as the first in a series that will spell the word “Remington” throughout the neighborhood. Artist Dominic Terlizzi will work with the community to complete the first phase of this project. The Upper Fell’s Point Improvement Association will create a tribute to jazz artist Billie Holiday, one-time resident of the community, with one mosaic, five murals, wall plaques and painted screens in the 200 block of South Durham Street. The block will be named “Lady Day Way” and serve as a community centerpiece and tourist destination. Artist Joe Rizza will create the Billie Holiday mosaic and muralists Michael Kirby, Bridget Cimino, Anne Kotleba and James Eichelberger will paint images of Billie Holiday on the designated walls on that block. The PNC Transformative Art Project, in its second year, awards sizable grants to communities to create “destination” art that will help bring together neighbors around the project and invite others into the community to enjoy the art. Last year’s winning communities were Greater Mondawmin, Hamilton-Lauraville, and Franklin Square. Join Peabody faculty member & pianist Brian Ganz as he hosts a benefit concert at Johns Hopkins Shriver Hall on Tuesday, April 9 at 7pm! All proceeds will benefit the Hopkins Odyssey lifelong learning program. Brian’s April 9 program will explore the theme of “Small and Infinite” works. Brian will play three mazurkas from Op. 7, the Trois Ecossaises, Op. 72, No. 3, The Lento con Gran Espressione, the Presto con Leggerezza, the Ballade No. 1 in G minor, Op. 23, and selections from the Preludes, Op. 28. The Johns Hopkins Odyssey program offers noncredit classes to students – of all ages – who have an interest to learn. This program is known as the Baltimore area’s lifelong learning partner. So come out and hear another wonderful performance by Brian, and support a great cause! For more details, visit http://odyssey.jhu.edu/events/index.html?ItemsID=62 or call 410-516-8516. See you on Tuesday, April 9!